FALLS CHURCH, Va. – On June 20th, Waverly Rare Books will auction an extraordinary photographic rarity – an Author’s Edition folio version of Eadweard Muybridge’s (British, 1830-1904) Animal Locomotion: An Electro-Photographic Investigation of Consecutive Phases of Animal Movements. The Complete Writings of Nathaniel Hawthorne, 23 vols., 1900-1901 with 1902 biography by George E. Woodbury. Est. $1,500-$2,500. Waverly Rare Books image. Initially published in 1887 as an 11-volume set, Animal Locomotion contained a total of 781 plates. Thirty-seven sets were produced and subsequently purchased by major art institutions, museums and libraries in New York, Boston and Philadelphia. The Public Edition of Animal Locomotion contained 100 plates and was issued by subscription for $100. “The subscriber would examine one of the complete sets in a public institution, then chose his or her favorites,” explained Waverly Rare Books’ director, Monika Schiavo. The Author’s Edition, which is the centerpiece of Waverly’s June 20 catalog auction, originally consisted of 21 plates selected by the author or editor from Muybridge’s complete series of animal locomotion plates. Of those 21 plates, one plate (Plate 465) is missing, leaving 20 plates. “Generally, a single lost plate can reduce a book’s value considerably, but in cases where the book is highly valuable, as is the case with this one, the loss in value is nowhere near as great, as buyers would have few – if any – alternatives,” said Schiavo. Citing auction comparables of the past, Schiavo noted that an Author’s Edition with 21 plates, personally inscribed by Muybridge, sold at Swann Galleries in March 2010 for $48,000. A copy of a Public Edition with 54 collotype plates sold for $14,900 at Sotheby’s in November 2008. Its condition was a question mark but “likely to be very poor, given the catalog description that said ‘Fragment only – Disbound,’” Schiavo said. In 2007 an album with 100 plates in faux morocco wraps with some dampstaining, minor handling wear, chipping to edges, and library markings sold for $45,000 – triple its high estimate – at Skinner, while a collection of 50 plates sold at Bloomsbury’s in 2012 for 38,000 pounds (approx. $58,200). Other auction records indicate that some individual plates have sold for as much as $5,000. Described by the Washington Post’s Frank Van Riper as “The Odd Genius Who Froze Motion,” Eadweard Muybridge was one of the most influential and eccentric photographers of all time. His instantly recognizable work merged the art and science of photography in a series of stop-action film sequences that paved the way for the modern motion picture industry. Muybridge’s prescient images have been collected and exhibited by the Tate Gallery, The Corcoran Gallery of Art and the Smithsonian’s National Museum of American History. Waverly Rare Books, a division of Quinn’s Auction Galleries, will offer the Eadweard Muybridge Author’s Edition of Animal Locomotion: An Electro-Photographic Investigation of Consecutive Phases of Animal Movements on June 20, with no reserve and a $12,000-$15,000 estimate. The 363-lot auction also includes a Patrick Henry land grant (Lot 339, est. $600-$900), four original, signed James Thurber drawings that appeared in the March 25, 1939 issue of The New Yorker (Lot 338, est. 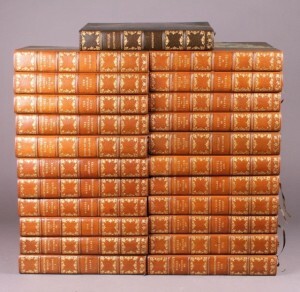 $4,000-$6,000), and a 23-volume set of The Complete Writings of Nathaniel Hawthorne (Lot 12, est. $1,500-$2,500). 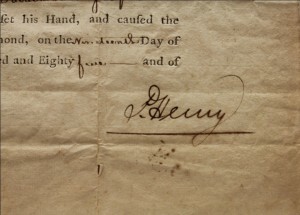 Close-up of signature from Nov. 19, 1785 land grant signed by Patrick Henry as governor of Virginia. Est. $600-$900. Waverly Rare Books image. A selection of important early maps is highlighted by Lot 317, a 1639-1675 engraved map with outstanding early images of Virginia, the Carolinas and Georgia; estimate: $600-$900. Another fascinating entry is Lot 311, a colorful 1846 folding pocket map of Texas, Oregon and California. Its accompanying text booklet is unflattering in its observations of Texas settlers of that time, describing “the female portion of the community [as] ignorant, degraded and the slaves of their husbands.” It also notes that the women are “very fond of dress and will make any sacrifice to gratify it.” As for the men, the writer says they “have no trades and depend for every thing upon the converted Indians, some of whom are quite ingenious, both as carpenters and blacksmiths. The whites…look upon all manual labor as degrading…” The map is in superb condition and is expected to make $4,000-$7,000. Waverly Rare Books’ June 20 auction will begin at 5 p.m. Eastern time. The preview begins on June 15 and continues through and including auction day (see website for hours). The gallery is closed on Sundays. 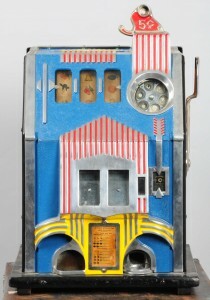 All forms of bidding will be available, including absentee or live via the Internet through www.LiveAuctioneers.com. For information on any lot in the sale, call 703-532-5632 or e-mail monika.schiavo@quinnsauction.com. Visit Waverly Rare Books online at www.quinnsauction.com.